I'm not going to be modest tonight - I have really been in a cooking groove lately. From delightful goat's milk-cardamom ice cream to a white bean stew (which served as the base for some incredible baked eggs this morning) to the minty-lemon lamb kebabs we had tonight, everything has been going my way. Culinarily, at least. I am already planning some exciting posts to share those new recipes, but for tonight, I thought I'd share a simple and tasty salad recipe that has become one of my stand-bys. Not surprisingly, this is a Middle-Eastern inspired dish, which is adapted from Paula Wolfert's invaluable book Mediterranean Cooking. I highly recommend the book which, upon purchasing, I immediately read cover-to-cover. At the very least though, you should try this salad recipe. I served it tonight with those luscious lamb kebabs and some homemade pita (so, so good), but it goes well with anything grilled or roasted. I won't pretend that this salad isn't best in the summer, when you can get delicious cucumbers and tomatoes, but it's still good at any time of the year. 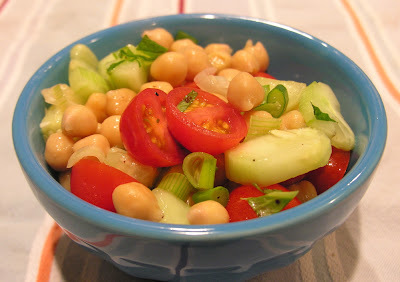 Mix tomatoes, cucumber, chickpeas, and green onions. Just prior to serving, chop mint and add to the salad. Top with lemon juice, olive oil, salt, and pepper, and stir to combine. I love chickpea salads. So so good!